Year first woman was elected to Australian Parliament? 1943. Year first female became leader of a state parliament? 1990. Year of first female Prime Minister? 2010. Mind blowing politics facts comin’ at ya! Yep, for most of you reading this, female political leadership is a thing that was only realised in your lifetime. It might feel funny to think of it like that, but it’s true. Over the coming weeks, Lip will be looking at policies and ideas that affect your votes as women. Let’s start with how the major parties “deal with” getting ladies elected. 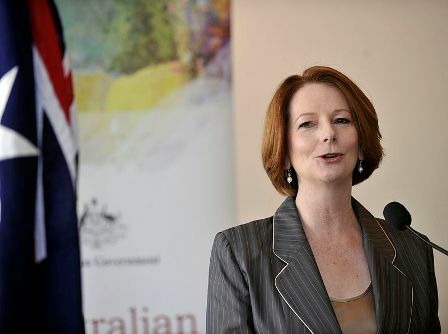 Well, some people have noticed that Julia Gillard is a lady woman type. She is Australia’s first female prime minister, and despite the rocky road, this fact has sent quite a message about the party’s ability to let women lead. But there’s a little more to it than that. In 1994 the ALP National Conference introduced affirmative action clauses into their national platform, aiming for 35% of women holding Labor seats by 2002. This affirmative action now operates on a 40:40:20 model and affects the duller yet really important side of politics known as party pre-selection, or choosing who will be the number one candidate of all the Labor Party peeps who want to be in parliament. The model stipulates that the Labor Party aim for 40% of seats held by women, 40% by men, with the remaining 20 being held by either gender, depending on who is up for it. This affirmative action has arguably made a big difference to how many Labor women get into office. They have consistently outdone the Liberals, Nationals and Greens in the number of senators and MPs that they’ve had since 1994. The Labor Party is also connected to political network Emily’s List, an Aussie version of the US women’s organisation. The group was established internally in the Labor Party in the mid nineties, and now exists outside of it. Emily’s List facilitates progressive female candidates by fundraising for campaigns and networking promising future candidates in the early stages of their careers. The Coalition has been criticised in recent years for having only two female members on their front bench (Julie Bishop and Sophie Mirabella). Broadly speaking, the Liberal Party has a history of focusing on merit before gender when it comes to candidates. They do not have an affirmative action policy like the Labor Party do. Instead they subscribe more to a meritocracy format, and in the past have been fiercely critical of policies that give women advantages because of their gender. That said, the Liberal Party do support gender equality in their organisational arm, just not for their electoral candidates. Deputy Opposition Leader Julie Bishop has been outspoken about Julia Gillard drawing attention to sexism in politics, and has reinforced that Liberal women are elected based on skills rather than gender. But at the beginning of this year, the Liberal Party commissioned former senator Kay Patterson to conduct an internal inquiry into the experiences of women in the Liberal Party. While women make up about 22% of the federal team, they are still behind the reported 37.3% that Labor can boast. In 2010 Liberal Senator Judith Troeth released a policy paper that suggested the party would benefit from quotas for women in parliament. This was rejected, but in the lead up to the 2013 election there’s been a fair bit of reflection on that in the press. The Greens aren’t considered a “major” party by many punters. That said, they’re not doing too badly on this front. Not only is their leader, Christine Milne, obviously a woman, they boast 6 female senators (in comparison to four male representatives in the House and Senate) at a Federal level. The Australian Greens support affirmative action in principle not just for women in positions of power, but for all under represented groups. Some voices say because they’ve never been the government, it’s hard to imagine what their actual policies on getting women into leadership roles would look like. That said, as you can see by their policy platforms here, they don’t seem too worried about tackling inequality of representation by actively seeking women to take part in democracy. Just last week Greens Leader Christine Milne posted on Mamamia justifying her support for quotas for women on company boards, and referencing her past expectations about women in positions of power. While she once believed that education and encouragement are enough, she now comments that a ‘boys club’ prevents women from accessing all areas of public life in a representative way. This year she called upon the government to stipulate that ASX200 companies have a minimum 40% of women on boards in the next five years. This perspective is perhaps indicative of the Greens’ world view on women in leadership overall. Since the Liberals conventionally operate in coalition with the National Party – and in Queensland they’re now one party – oughtn’t the figures of the National Party be considered here? It’s not clear why they should be ignored in favour of the Greens. This entry was posted in Politics and tagged australian politics, politics, the major parties on. Bookmark the permalink.